Mooresville, NC – An off weekend for the NASCAR XFINITY Series? Not for Gase. He announced earlier today that he will be pulling double duty at Talladega Superspeedway teaming up with StarCom Racing for 1000Bulbs.com 500 in the #00 and Copp Motorsports in the #83 truck for the Fred’s 250 powered by Coca-Cola. It will be Gase’s fourth race with StarCom Racing this season and second time with the team at Talladega. However, it will be Gase’s first ever start in the Truck Series. Gase is bringing along his NXS primary sponsor and Alabama native company, Sparks Energy Inc., on his #00 Chevrolet Camaro and #83 Chevrolet Silverado. A Monster Energy NASCAR Cup Series ride and Camping World Truck Series at the famed Talladega for Gase is always something special; but what he and Sparks Energy Inc are doing makes these rides even more special than most. Sparks Energy will be donating their sponsorship to the Prayers For Kayleigh Foundation for pediatric cancer research at St. Jude Children’s Research Hospital. The PFK Foundation was founded by the McClendon Family to help raise funds and awareness for pediatric cancer research after their daughter, Kayleigh, lost her battle to terminal brain cancer, Diffuse Intrinsic Pontine Gliomas (DIPG) at the tender age of 7. 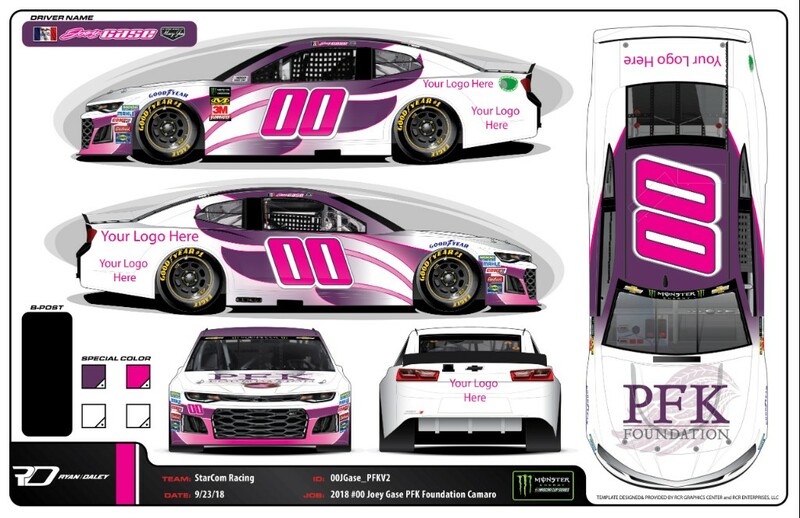 Sparks Energy is reaching out to the community to help find associate sponsors to come aboard the PFK Foundation #00 and the #83. However, 100% of the sponsorship proceeds will be donated to the PFK Foundation for DIPG research. If you would like to come on board to support this great cause, please email company@sparksinc.com or joeygasepr@gmail.com. From the moment Kayleigh was diagnosed with DIPG our family was surrounded with amazing supporters. From our family, to our town, to our amazing medical team at St. Jude Children’s Research Hospital – we have been blessed. Now, it is our turn to honor our precious girl’s memory and give back. The PFK Foundation is Kayleigh’s legacy, a legacy of hope, joy, and a brighter future for all children fighting cancer. Our primary objective is to raise funds and awareness for pediatric cancer research. Currently, we are partnering with St. Jude Children’s Research Hospital to help fund new DIPG research, as well as give back to the community that has so graciously cared for us. Together we can make a difference! Sparks Energy, Inc. was founded in 2007 to address a growing need by both Investor Owned Utilities and Electric Co-ops for a quality workforce to perform storm response and energy restoration services. The Sparks Energy, Inc. team has over 35 years of experience in utility construction and management. Sparks is a committed leader in Energy Restoration Management. Their crews are qualified for overhead/underground distribution, transmission, substation and ROW operations. They are composed of both union and non-union crews. The crews remain non-associated with mutual aid giving them the ability to move throughout the U.S. without having to request RMAG releases.